← An Anthem for Solidarity? Concord Art Space, the group’s LA-based flagship, reflects this ideology and P.S.1010, or the group’s latest bus project, likewise, expands such thinking into new uncharted territories. As an unaffiliated artist who often longs for community, I fell into Concord Space quite readily at the tail end of 2012, when Kate Durbin, a poet/artist friend, recommended me to take part in a group reading there called ENTER>text, curated by Marco Franco Di Domenico and Henry Hoke. At ENTER>text “there is no stage, no podium.” Essentially there is no “at”—only a state of meeting or becoming. Readers/Artists are scattered about the space, performing simultaneously, and attendees are free to wander throughout in small groups. Considered “a living literary journal,” this event boasts no reading order hierarchy, only a strong sense of mood and joyful camaraderie. Here, I found art flourishing without the pretenses of status. I was easily welcomed and hooked on the euphoria of connecting with my audience, intimately—personally. There is an airy and magical quality to artistic communities such as Concord, and this is exactly why such spaces need to keep moving and breathing. In general, during hard economic times, it’s easy for our thinking to get mired down in job scarcity or sluggish spending: focusing on the negative, developing art out of irony or fiercely rebelling against it. I’m thinking here about the Occupy Movement and activist art like Barbara Kruger’s public slogans which cleverly appropriate advertisements. Although these agenda-driven gatherings and tongue in cheek artful protests are incredibly important, I would also like to advocate for the simple act of creatively engaging with a community as an inadvertent form of activism: lifting up the masses by empowering relationships and encouraging new ways of seeing or looking. This is what I like about P.S.1010. The collective seems to rely on a belief in street education, or creating a fringe space for learning outside of the classroom, where teachers are students and artists are people and vice versa—where activism or art is the result of doing and being or sharing. For clarity on what I mean, let’s look at another project, already in full swing, that shares a similar ideology: JR’s INSIDE OUT. This endeavor takes the street art act of blowing up portraits and pasting them in public spaces to a new level of ownership—one where its subjects and artists are not necessarily in rebellion against government or a gallery system, but more so, simply engaged in recognizing the power of imagery in relation to presence and society. Every day, we are bombarded by billboard imagery which reflects not only power, but wealth, control, and importance—this could be relative to fame in Times Square or political presence in Tunisia. As a society, we grow accustomed to this type of power. It can generate a mass feeling of longing, oppression, or burden. What INSIDE OUT does, and does well, is reverse the power by collaborating with participants to reverse the imagery. Participants, or “regular people,” submit their own photographic portraits to the INSIDE OUT team, then the images are blown up and mailed back. Each participant is free to showcase his/her portrait on any public wall in the community. The whole process and resulting worldwide collection provides a platform for everyday people to be seen, and through the simple act of being seen, the masses can essentially be heard. Similar to INSIDE OUT, P.S.1010 seems interested in a curious rhizomatic journey where art is not just a performance or experience, but collective investigation with the ability to allow social issues to surface organically in relation to what each culture or society demands. 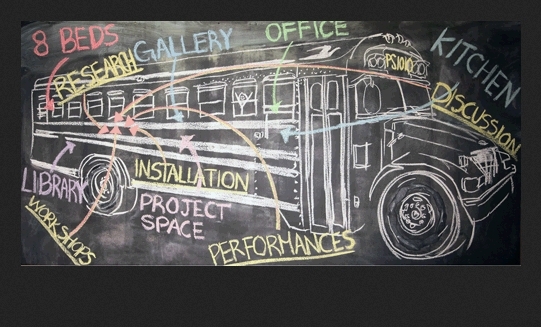 In other words, “A school bus operates on the fringes of institutions: between school and home”—this is not about one extreme or the other, but a social transient place for art in motion: bypassing agenda, going further into the heart of society and man, exploring possibility while unpacking the beating and thumping mobilization of art. To learn more about P.S.1010, start a dialogue, or support its funding, click here.